So, why to need to palletize? Although labor and throughput gains can be significant, the last item, safety and ergonomics, is near the top of everyone’s list. Repetitive Strain Injury (RSI) statistics are compelling. 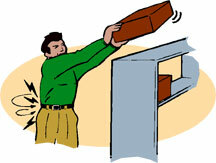 Over the past 30 years, RSI’s have grown from less than 20% to almost 70% of all workplace illnesses. These costs are well-documented. Facilities managers are looking up and down their internal logistics supply chain to eliminate or reduce activities which contribute to RSI’s. Hand palletizing is one of a number of targeted areas in distribution and order fulfillment centers to reduce these injuries. Other common examples are carousels and pick-to-light systems to not just bring the product to the picker, but also deliver it into a more comfortable vertical picking zone. Likewise, most warehouse management software applications now slot those items picked regularly into pick locations that are in a “golden” vertical zone. With respect to palletizers, the decision to use one or not use one is straightforward. And the return on investment calculation is not difficult to understand. Any of the benefit areas mentioned above can almost stand on its own to justify implementing a palletizer (s) in the right application. In most cases, all of the benefits above accrue to some degree. Where more time is typically invested is evaluating which of today’s technologies is the best for your organization, today, and in the future. 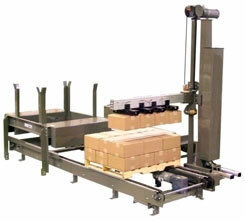 Palletizing solutions are more scalable and modular, than in the past. One example is the product shown below, which is essentially “plug and play”. All controls are self-contained. A contact closure is provided for controlling an infeed conveyor. Once the pallet is completed, it is discharged to either a gravity or powered take-away conveyor. Empty pallets are automatically moved into position to accept new layers of product. In the next segment, we will take a brief look at which basic machines are appropriate for both moderate, and higher throughput applications. We will also share costs estimates for these, then ultimately look at your return on investment calculations.